As humans we all go off the wall once in a while – how about off the map? Health care practitioners have constructed a guideline known as a bio-map indicating healthy parameters for “acceptable” behavior. Also referred to as emotional mapping, it is used as a diagnostic tool when assisting an individual through the territories of life. As we all know, life is not always a chauffeured party bus ride and most of us should use all the guidance we can get. 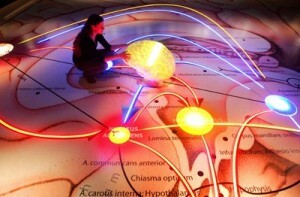 Emotional mapping is a methodology that measures people’s reactions to various stimulus. It is used not just to enhance an individual’s performance, but also as a community service. In a study by Christian Nold done over a period of five years, 2,000 people’s emotional reactions were monitored as they traveled to various geographic locations. Participants wore a device invented by Nold to measure their Galvanic Skin Response, GRS. GRS indicates emotional responses through the electrodermal activity of the skin. As participants went into different areas of cities and the surrounding areas their emotions were registered indicating a wide range of reactions to favorable to not so pleasing. On their return a map was devised around their high and low emotional arousal. By studying these finding maps could be composed that showed how to avoid unpleasant situations and create more amiable surroundings. Noting from emotional mapping, city planners can take this information into community development. Pairing a positive response with overall feelings regarding a particular area, building appeal, the usage of green space, location of conveniences, etc. helping to design a more pleasing environment. While we all have a spectrum of emotions, scientist have discovered that we feel the sensations across the board pretty much the same. When we are anxious we get butterflies, or when we get angry we feel “hot headed” or when we are depressed we fold into our core as a reflex of comfort. A team of scientist in Finland asked people to tell them where they felt different emotions within their bodies. After studying three cultures to determine the extent of how much we share when feeling emotions, a graphic map was established showing our different emotional states in color. The results were consistent when people reported feelings of happiness they felt the emotion through out their entire body whereas depression had just the opposite effect. The deadening of feeling in arms and legs and even the head were indicated when feeling blue. 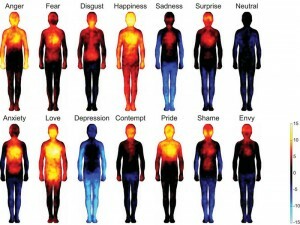 Interestingly participants in this emotional mapping reported that anger activated their arms. Scientist are hoping to use emotional mapping as a tool to help diagnose or treat mood disorders. Maps are one of the constants that appear limitless. Using them for personal or community welfare, mental or physical well-being, it seems there is no end to the universal utility they offer. What is your interest in mapping? Have you used maps for an unusual adventure, either to the outer realms of this world or inward to your private domain? Leave a comment below and share your experience with map with me at Navigate Maps.